Here’s a stylish free pattern to crochet from your scrap yarn, for Barbie or one of her friends. 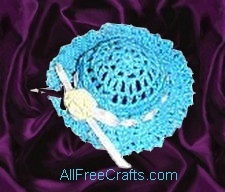 Make another one to use on your wrist as a crocheted pin cushion! Rnd 2: Chain 2,hdc in first chain2 sp,(hdc in next st, hdc in next sp)around, join with sl st in top of ch 2. Rnd 5: Chain 1, sc in first st, 2 sc in next ch-2 sp,(sc in next st, 2 sc in next ch 2-sp)around, join with sl st in first sc. Rnd 7: (Chain 4,sc in next ch-3 sp)around to last sp,chain 4, join with sl st in top of hdc. Rnd 9: Chain 1,(sc in next st, ch 3,skip next st) around, join. Fasten off. To block off you can either use a 1″ inch styrofoam ball, cut in half and wrapped in plastic wrap, or half of a plastic easter egg. Dip your hat in any fabric stiffener, squeeze out, then drape the hat over the half egg shape or styrofoam ball. Make sure you have plastic wrap on the bottom. You can pin the ch lp down around but I just molded and pushed the brim flat. Let dry. Weave the ribbon through sts of rnd 4: tie the ends in a bow and glue a ribbon rose in the center.